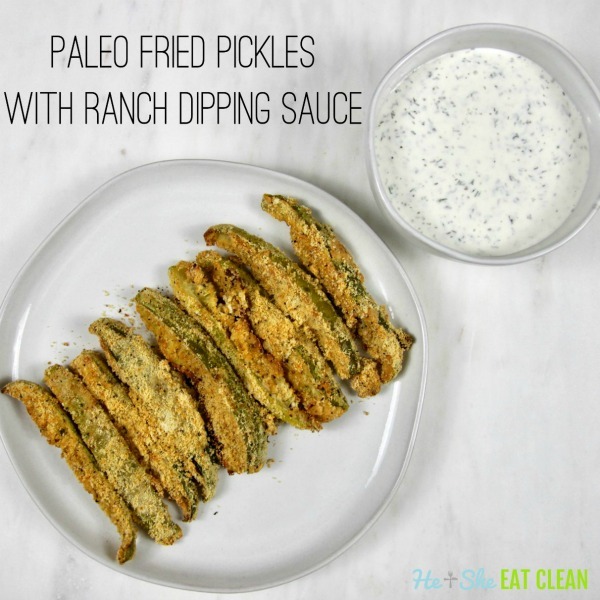 These Paleo Fried Pickles are gluten-free, low-carb, and paleo and clean eating approved. I’m not going to lie. We made these at 10 PM on a Saturday night. The Saturday night before the Super Bowl to be exact. Scott just randomly had the idea to make these and they turned out REALLY good so now we are sharing the recipe! Down here in the south you can get anything fried. Fried pickles, fried Oreos, fried whatever you want. To be honest, I’ve never had anything unusual fried. I would rather just stick with my french fries BUT if I were to imagine what a friend pickle tastes like, this is it. 100%. So good. Next up. Onion rings. We’ve made them a different way before but I think we will try this exact recipe next time! Don’t forget to make the low-carb ranch dip – it’s a game-changer! Place on baking sheet and bake for 10-12 minutes. After 10-12 minutes, flip pickles and bake another 10-12 minutes or until golden brown.